Please note: The mounting process is always based on your individual application of it. The parameters may vary depending on your system. Start your web browser and type http://max2play/ (or the hostname you have given to the particular device, respectively) into the URL bar in order to get access to the Max2Play browser interface. Click on the menu item „Filesystem/Mount“. Read the instructions on the bottom of the page carefully. If you need write and read permissions for your SambaShare, follow the Example #1 and enter „0777“ in the „Create Mode“ field. In the first field, you need enter a name for the share. That name will appear on other devices to indicate the share. The second field requires the actual path of your share. You need select an existing path on your filesystem. The comment feature of the third field is the only optional field. You can copy and paste the example for better recognition. The fourth field asks whether the share should be writeable or not. You can either enter „yes“ or „no“. In the last field, you can enter the write mode. The default is 664 for reading, for full writing rights enter „0777“. After having filled out all boxes, click the „save“ button. 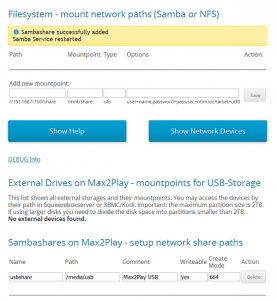 Just enter a preferred user and password right below, to access the SambaShare from any device in the network. 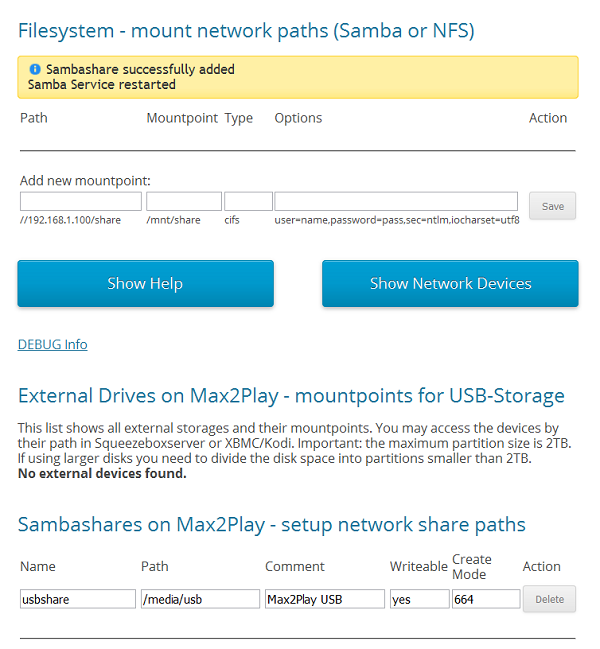 Important: You need to enter a password for the SambaShare’s to be accessible.